TORONTO Modern BlackBerrys with physical keyboards are now available in the U.S., months after the touch-screen versions went on sale. 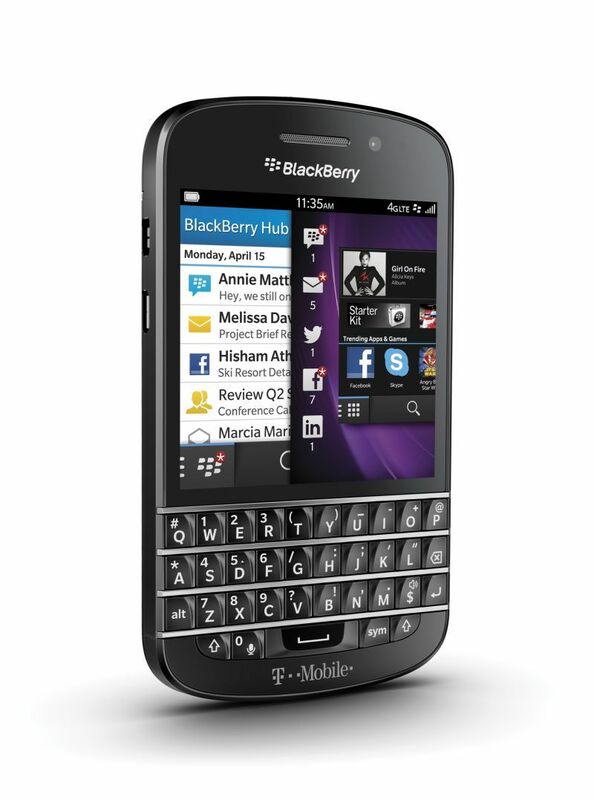 T-Mobile USA began selling the BlackBerry Q10 on Wednesday. It has Research In Motion Ltd.'s (BBRY) new BlackBerry 10 operating system, which addresses shortcomings that allowed the iPhone and Android devices to surpass the once-pioneering BlackBerry in sales and prestige. Verizon, AT&T and Sprint also have plans to sell the Q10 in the U.S. Verizon Wireless started taking orders last week and says it will ship by Thursday. AT&T started taking orders Wednesday. Neither Verizon (VZ) nor AT&T Inc. (T) has said when it will have the phones in stores. The last of the major national carriers, Sprint Nextel Corp. (S), has said it will carry the phone this summer. RIM's chief operating officer, Kristian Tear, said that he doesn't regret RIM's decision to release a touch version first, even though it was new territory for the company. Many longtime BlackBerry users prefer a physical keyboard, which has been RIM's strength. "It's obviously a larger market size, the full touch," he said in an interview. "I think it was right to do that No. 1. To get Q10 out now, not too long after, is a good second step." The BlackBerry, pioneered in 1999, had been the dominant smartphone for on-the-go business people and other consumers before the iPhone debuted in 2007 and showed that phones can handle much more than e-mail and phone calls. RIM faced numerous delays modernizing its operating system with the BlackBerry 10. During that time, it had to cut more than 5,000 jobs and saw shareholder wealth decline by more than $70 billion. RIM's touch-only devices in the past haven't been successful. Meanwhile, its rivals have largely abandoned efforts at making smartphones with physical keyboards. That's an area RIM long has been strong in. Tear said loyal Blackberry users are eager to upgrade to the Q10, and he expects RIM to win back people who had left for rival devices. Colin Gillis, an analyst at BGC Partners, said the keyboard version has a much greater chance at success than the touch version. He calls the Z10 just another slab of glass that doesn't differentiate much what rivals offer. He said RIM's base has always favored the keyboard. "That's why I always found it kind of odd that they didn't lead with the strength," Gillis said. Nonetheless, RIM surprised Wall Street in March by returning to profitability and shipping about 1 million touch-screen BlackBerry Z10 phones in the quarter that ended March 2. It will take several quarters, though, to know whether RIM is on a path toward a successful turnaround. Jefferies analyst Peter Misek said it was smart to start with touch to give the Z10 a chance. Otherwise, he said, people might not have tried it and just gone to the Q10 and its keyboard. Misek, however, has said that retail checks in the U.K. and Canada show that demand is higher for the Q10 than the Z10. The Q10 has been available in Canada, the U.K. and other countries since early May. The Z10 has been available in Canada and the U.K. for several months and in the U.S. since late March. RIM CEO Thorsten Heins has said U.S. carrier testing of the new BlackBerry 10 software is the reason for the delayed launch in the U.S.
RIM's stock increased 21 cents, or 1.6 percent, to $13.75 in afternoon trading Wednesday.